It is not often that stallions of the calibre of Dankeschon arrive in the UK. Performance test champion (scoring 9.5 for temperament), qualified for the Bundeschampionate, a solid competition record up to Inter II, training towards Grand Prix, plus a very interesting pedigree top and bottom. 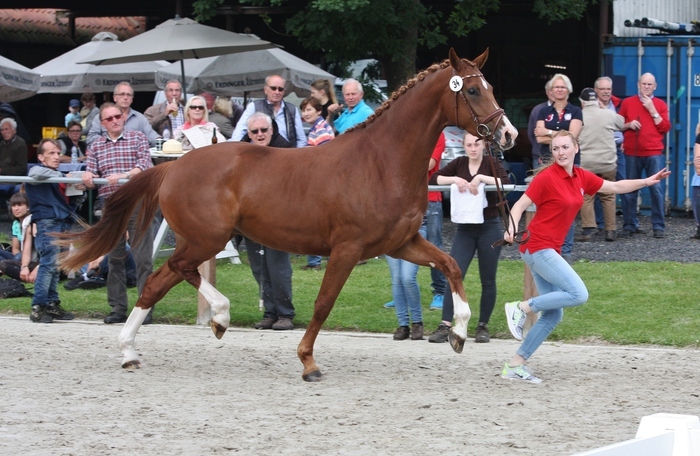 This strongly made liver chestnut had caught my eye in Germany over a number of years, when I had seen him under saddle demonstrating his powerful paces. He looks smaller than his 170cm until you stand close to him, as he is so compact with good short cannon bones. He has a lot of stallion presence with a slightly high set and strong neck and suits blood mares, or mares that you are looking to add limb and strength too. 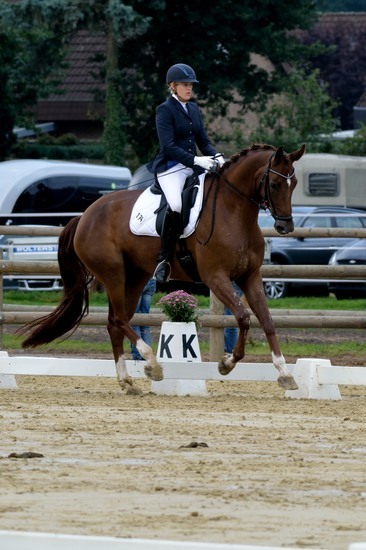 Dancing Magic – ( x Rockwell) – Reserve Champion of her mare performance test, heading the dressage section. Delayla ( x Fruhlingsrausch) – jumped 6yo young horse classes and L level dressage. 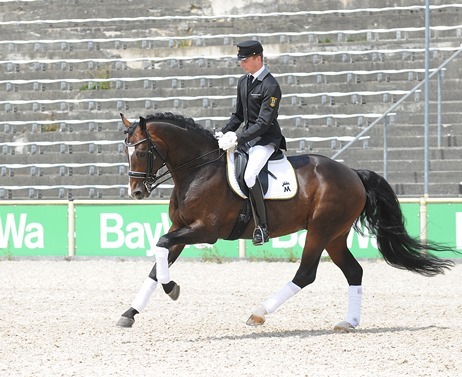 Dresscode ( x Florestan I ) – sold for 150,000 Euros at private auction in 2018 and competing L level dressage. I am going to start with Dankeschon’s motherline as this is one of the aspects that makes him an incredibly interesting breeding stallion. His dam, the State Premium mare Fantasie, was a finalist at the Westfalien Elite mare show. She has produced two other licensed sons in addition to Dankeschon. These were Dancing Diamond (by Diamond Hit) who is competing internationally at small tour and Dankeschon’s full brother Davos (State Stud Marbach). Fantasie is the full sister to no less than four licensed stallions, the brothers Farewell I, II, III and IV. Farewell III was the 6 year old Bundeschampion and competed to Grand Prix and Farewell IV competes internationally in Central America. The immediate motherline has produced a large number of Elite and State Premium mares, Grand Prix competitor Enigma, as well as interesting stallions such as Florentainer (Inter I) and Licosto (Inter I). Fantasia’s sire Fidermark is one of the most influential of all Westfalien stallions, despite his premature death at the age of 9. His sons include licensing champion Furst Piccolo, Grand Prix stallion Falsterbo and the fabulous Fidertanz (sire of Foundation and Franziskus). Now to review the sire line, starting with Dankeschon’s sire Danone. This Hanoverian son of De Niro was Champion of his licensing in 2003, qualified for the Bundeschampionate and was a finalist at the Young Horse World Championships at Verden before moving on to Grand Prix. 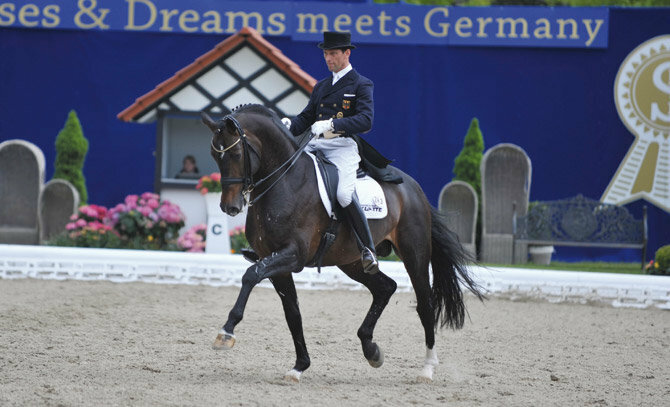 Danone is the sire of a number of Grand Prix competitors including the Championship horse and top sire Dante Weltino and European Championship contender Der Kleine Lord. 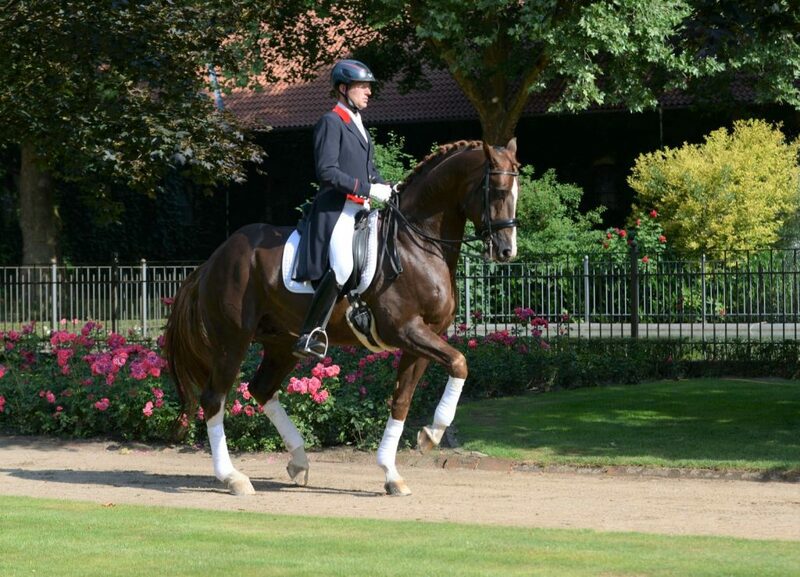 Danone’s sire De Niro needs no introduction as the World Number 1 producer of dressage horses. Danone’s damsire is Weltmeyer who provides the noticeable aptitude for collection. 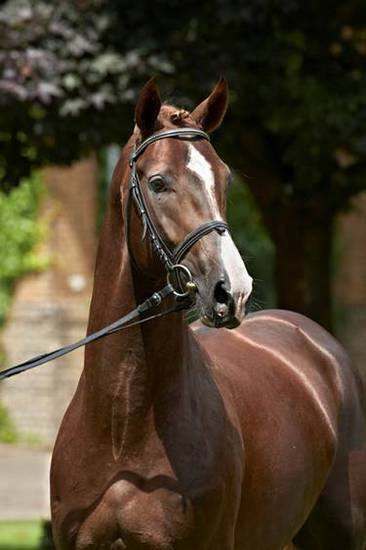 With this impressive genetic cocktail, combined with his own super paces and performance record, Dankeschon is a welcome addition to the British stallion line up.